This article presents some practical ESL activity and game ideas for teaching possessive adjectives to beginners. 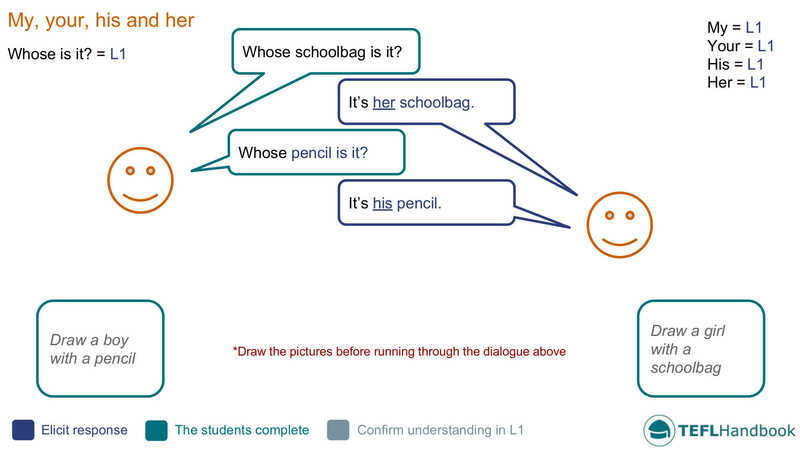 Feel free to use this a sample EFL lesson plan, or to supplement an existing one. As always, our lesson plans require minimal resources (markers and a whiteboard). Start by translating some simple possessive pronouns on the board and doing a basic drill using your fingers. Next, draw the two images in the lower corners, and ask the class what they see. 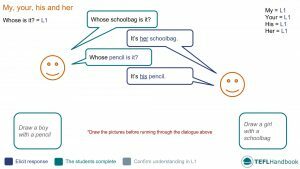 Finally, introduce the question structure that they'll be using for the lesson and elicit a simple dialogue in the centre of the board. Drill students using your fingers. Use the following instructions to create a drill for possessive adjectives. My: Put your finger on your chest. Your: Point at the student in front of you. His: Point at a male student. Her: Point at a female student. Students work to connect pronouns to their corresponding possessive adjectives. Test your students' understanding of possessive adjectives with this ESL grammar activity. Start by writing the pronouns I, you, he and she in a random fashion on the left-hand side of the board. Then, the possessive adjectives my, your, his and her in a similar manner on the right-hand side. Have the students copy the board and draw connecting lines from the pronouns to the adjectives. For this speaking activity, you'll query the students trying to elicit the correct usage of possessive adjectives. Move around the classroom pointing at different possessions, asking individual students “whose ___ is this?”. Vary your questions so that you are testing each possessive adjective. After a while, you could have a student take your place. A fun memory game where students have to remember the owner of an item. This fun little ESL game idea works quite well kids. Divide the class into two teams. Fill a bag or box with a possession from each student. On each turn, a student has to use the correct possessive adjective to determine the owner. You will randomly select the object, and students get one point for naming it and another for identifying the owner using the correct possessive adjective. For a worksheet to accompany this lesson plan, we recommend 'possessive adjectives' at islcollective. If you are looking for an ESL lesson plan for adults, this plan at brainpop.com is an excellent resource for just that. Also, If you have access to better-equipped classrooms, eslgamesplus have a fantastic multimedia board game quiz that tests possessive adjectives. This neat little video on possessive adjectives from koomakids will give a bit of sound and colour to the topic. Perfect for kids' classes. We hope that you've found a few of these ideas useful. Our suggested next lesson is on using 'have' and 'have got'. Be sure to check out our complete list of ESL lesson plans for beginners (A1 Mid-level), as well as our entire collection of ESL lesson plans, from beginner to intermediate. Also, if you are an Android or iOS user, this lesson plan is available for free on the TEFL Handbook app. An ESL lesson planner for English teachers.